May 13, 1939: Filming continued on Babes in Arms on the “Interior Randall’s Office” and “Interior Moran’s Living Room” sets. Time called: 9 a.m.; lunch: 12:40 – 1:40 p.m.; time dismissed: 5:55 p.m. The film shot on both of these sets must not have been much (if any) of the accompanying numbers (“Good Morning” and “Opera vs. Jazz”) since Judy, Mickey Rooney, and Betty Jaynes did not complete those pre-recording until May 15th. May 13, 1942: Filming on For Me And My Gal continued on the “Interior Jo’s Hotel Room” set. Time called: 10 a.m.; dismissed: 5:58 p.m.
May 13, 1943: Judy, Mickey Rooney, and the rest of the cast and crew of Girl Crazy were back in Los Angeles after filming on location in Palm Springs, California. This first day of filming after that return consisted of scenes on the “Interior Gov’s [Governor’s] Office” and “Exterior Road” sets. Time called 10 a.m.; dismissed: 3 p.m.
May 13, 1947: Judy pre-recorded both “Love Of My Life” and “You Can Do No Wrong” for The Pirate. “Love Of My Life” was a re-recording. The original version was recorded on December 27, 1946, and was unused in the final film. Here are the two songs as recently restored and remastered by Richard Moore at Mint Audio Restoration for the fantastic 2-CD set “Judy Garland – Soundtracks.” These two recordings, along with all of the recordings on the set, were in desperate need of remastering. The technology advances in the past several years have allowed professional audio engineers to revisit recordings and breathe new life into them. It’s pretty amazing what they can accomplish. Here are the remastered versions of the two songs Judy recording on this day in 1947, with explanatory text provided by Moore. Purchase this set here, you won’t be disappointed! 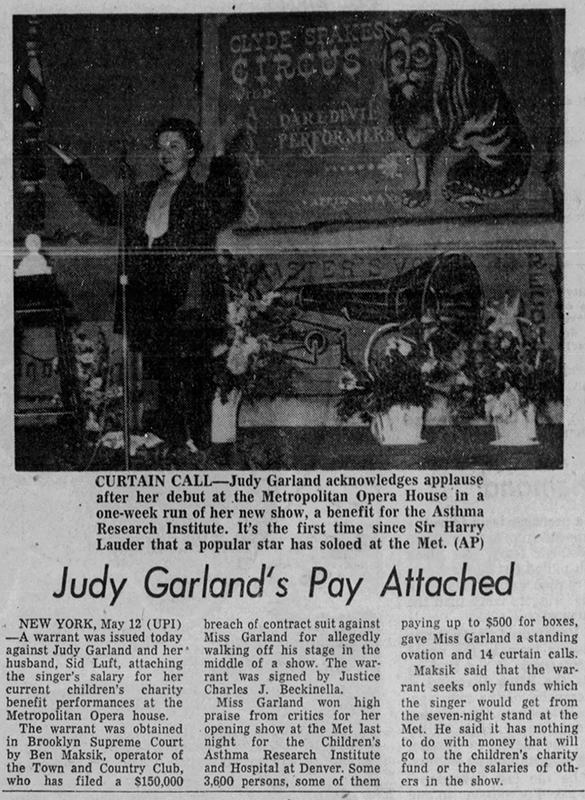 May 13, 1952: This amusing article reports on the fact that the trained dog named “Red Dust” came away from Judy’s show with a movie contract. Judy was currently enjoying phenomenal success in her four-week engagement at the Philharmonic in Los Angeles. 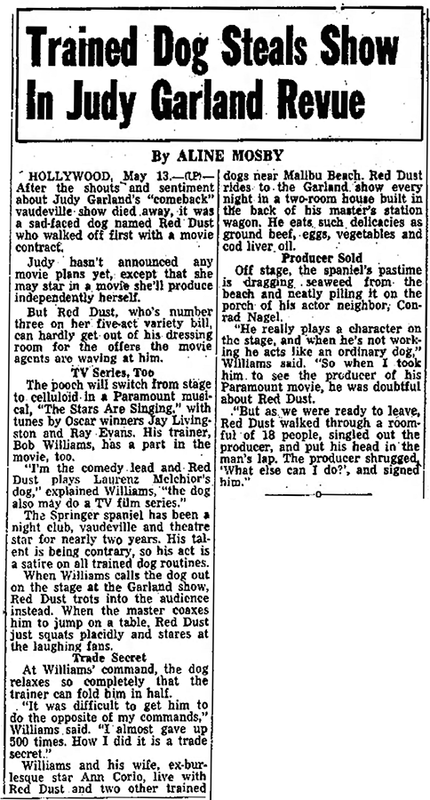 After the shouts and sentiment about Judy Garland’s “comeback” vaudeville show died away, it was a sad-faced dog named Red Dust who walked off first with a movie contract. Judy hasn’t announced any movie plans yet, except that she may star in a movie she’ll produce independently herself. But Red Dust, who’s number three on her five-act variety bill, can hardly get out of his dressing room for the offers the movie agents are waving at him. 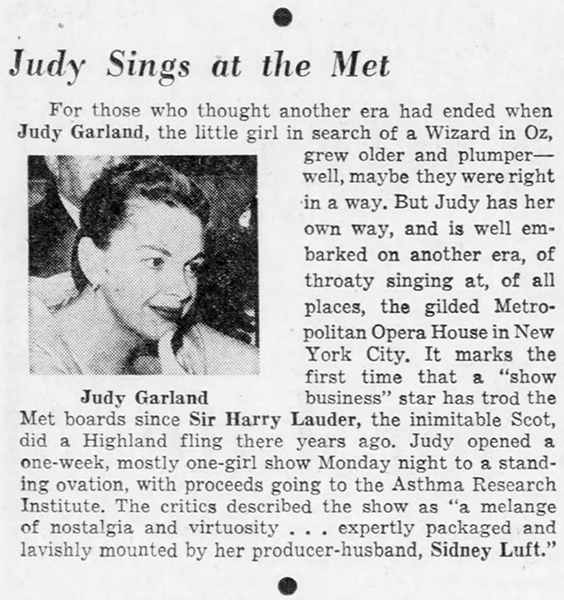 May 13, 1958: Newspapers were filled with raves for Judy’s recent opening at The Metropolitan Opera House in New York. Unfortunately, the raves were overshadowed with the news that a warrant had been attached to Judy’s salary. 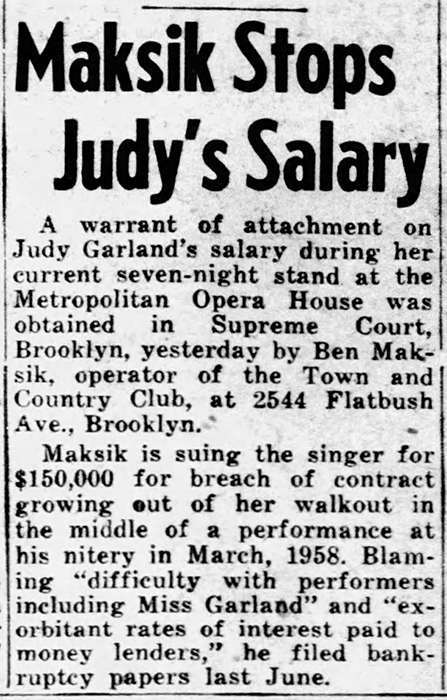 It was obtained by Ben Masik, operator of the Town and Country Club in Brooklyn that Judy had performed at in March 1958. He was suing her for $150,000 for breach of contract. The newspapers just couldn’t resist mentioning Judy’s weight – again! 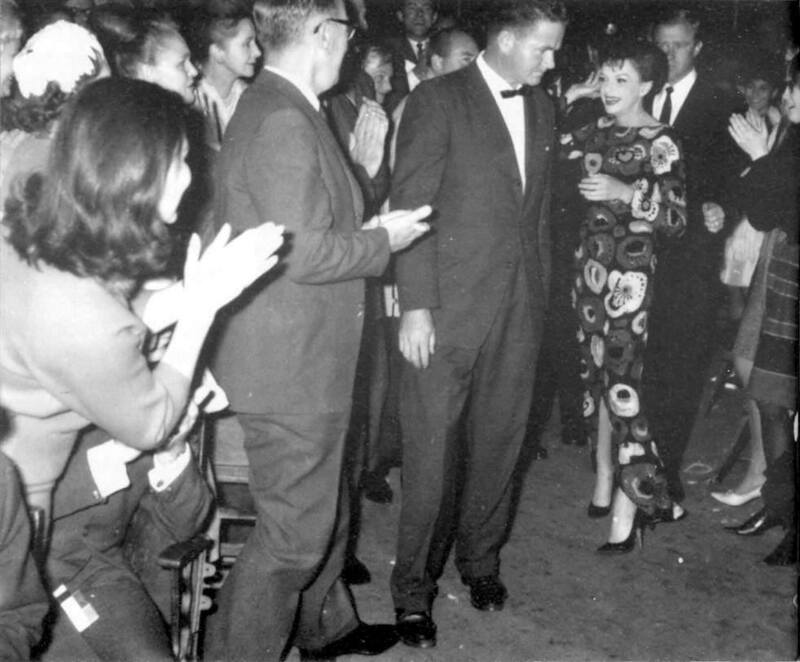 On March 30, 1958, Judy managed to get through the first two songs (the second of which was “I Can’t Give You Anything But Love”) of her act at the Town and Country, then announced that she had been fired and left the stage. She had developed severe colitis shortly after opening at the venue but had somehow managed to get through her shows until this night when the manager of the club fired her. Judy hired Bartley Crum as her lawyer. Crum was also representing Rita Hayworth and her recent legal issues. By May 16th it was reported that the musicians and other performers in Judy’s show were threatening to quit out of fear that the lawsuit would keep them from being paid. 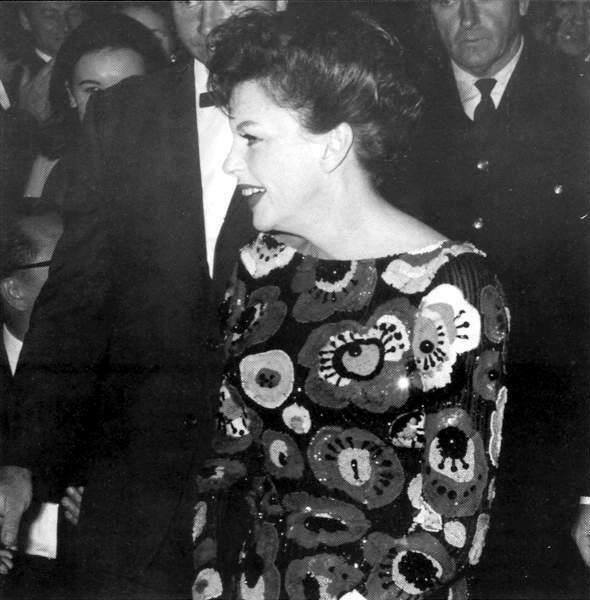 This prompted Judy to make a statement saying that she was suffering irreparable damages. Justice Charles J. Beckinella reserved any decision in the matter. 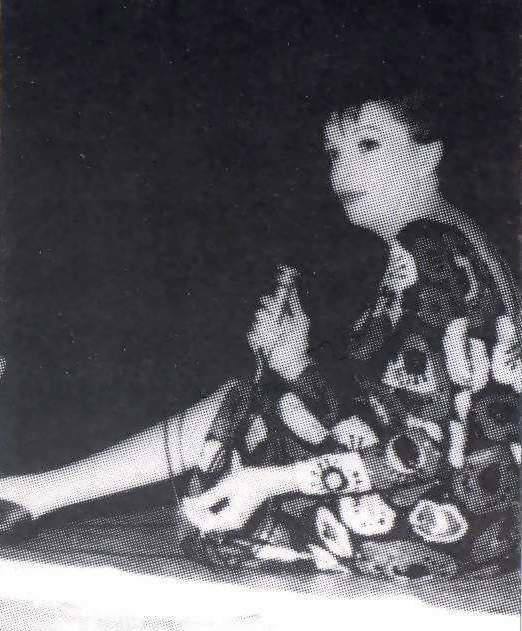 May 13, 1964: Judy’s return to the stage, and first professional engagement since her TV series ended, occurred when she took the stages at the Sydney Stadium in Sydney, Australia. The concert was a huge success, garnering great reviews. 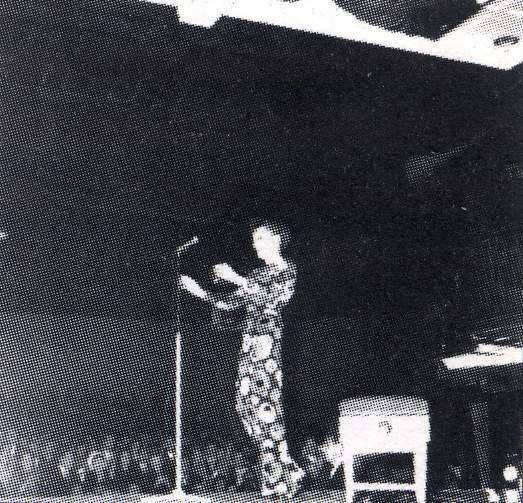 Judy performed for an audience of approximately 10,000! This review from the May 14, 1964, edition of The Sydney Morning Herald provides some great details about the concert. With her loud, clear voice spilling songs like “San Francisco” over the Sydney Stadium’s bleachers, world-famous singer Judy Garland held a nostalgic audience of more than 10,000 spellbound last night. 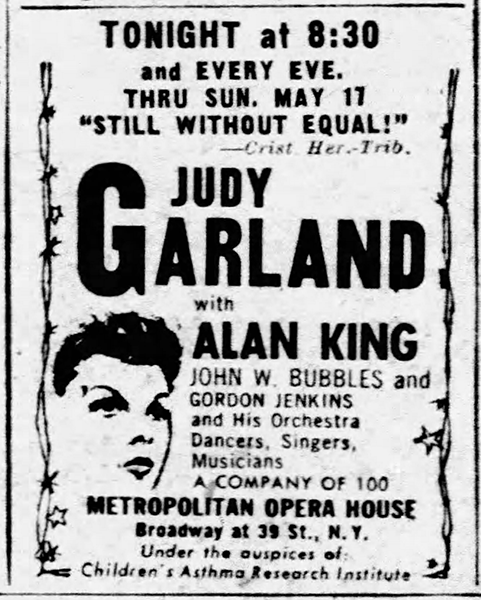 The Stadium will probably never recover from the Judy Garland Show. The old building was treated to the nearest thing to a Hollywood spectacular it has ever had. 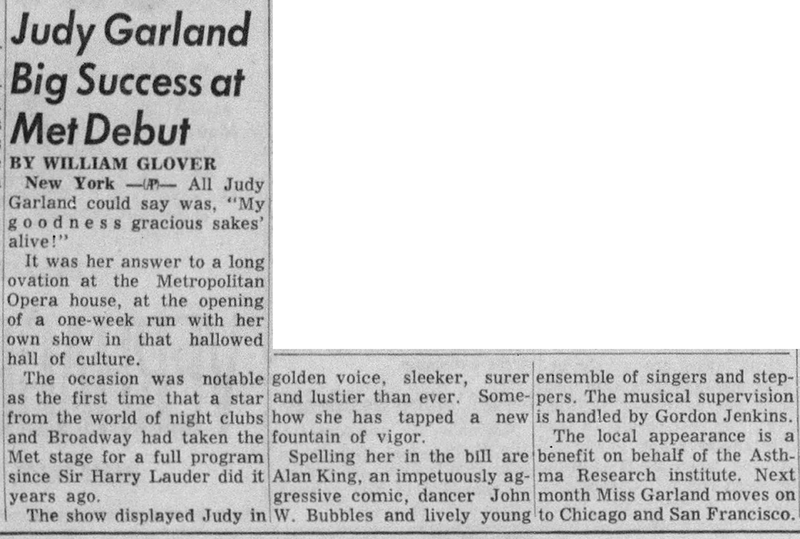 Miss Garland sang more than 20 songs in her two hours on stage. 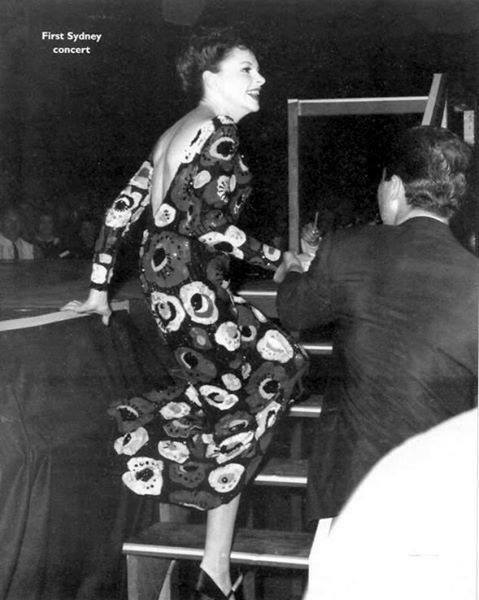 For most of the time she was alone on the stage, except when members of the 30-piece orchestra climbed on the stage too. 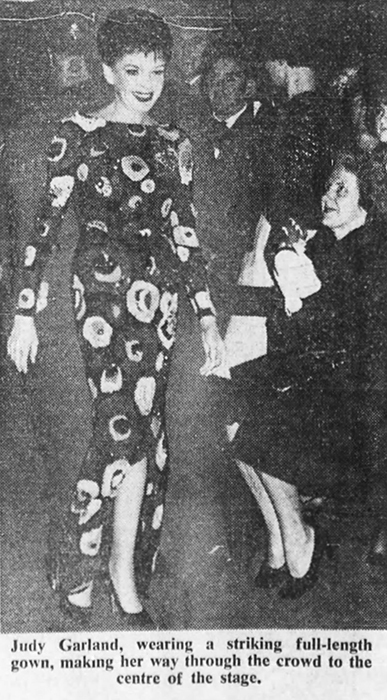 Wearing first a beaded sheath dress, and later tampered white slacks, she pranced, hugged herself, squatted on the stage, perched on the piano and powdered her nose. She had to have the microphone turned up in the first half, but sang strongly and confidently in the second. Someone else thrust through the crowd to hand her a toy koala and, when she finished the show, people crowded the stage, stretched out their hands and touched her. When the final notes of “Somewhere Over The Rainbow” died, the audience cheered, whistled, stamped their feet and called for more. Saying that she had forgotten the words, she squatted on the stage with the orchestra’s score and read some of the lyrics from there. The capacity crowd cheered the star to a huge success, but they had their money’s worth even before she appeared. Outside cars and people banked up Bayswater Road were greeted by coloured searchlights. Across the road the Leichhardt Municipal Band puffed its way through Garland medleys. So many people crowded the entrances to the Stadium that the show started 30 minutes late. Nobody minded.